Two new Battle Sisters are revealed, both dealing in Power buffs. Cont (RC) GB1 Oracle: This Unit gains Power+2000. 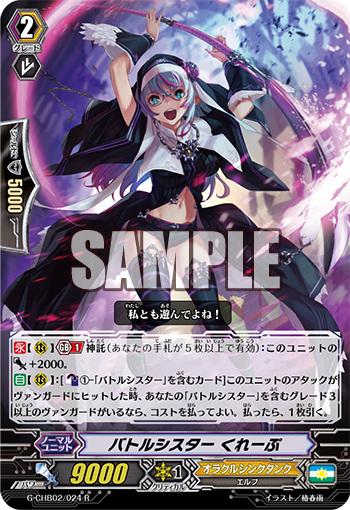 Auto (RC): [Counter Blast 1 – “Battle Sister” card] When this Unit’s attack hits a Vanguard, and you have a Grade 3 or higher “Battle Sister” Vanguard, you can pay the cost. If you pay it, draw 1 card. Auto (RC): During your turn, when another “Battle Sister” Unit is placed on (VC) or (RC), during that turn, this Unit gains Power+2000. For Today’s Card we’re introducing from Character Booster “We Are!!! Trinity Dragon” (on sale January 13th, 2017), two of 《Oracle Think Tank》’s “Battle Sisters”, “Battle Sister Crepe” and “Battle Sister, Berry-Mousse”. “Battle Sister, Crepe” is an Attacker who can draw 1 card when its attack hits a Vanguard. And if you’ve achieved 【Oracle】（i.e. once you have 5 or more cards in your hand）, it gains Power+2000. If you combine it with the Stride Skill of “Battle Sister, Madeleine”, whether or not you hit or don’t hit, you’ll be able to activate one effect or another. So you can trust it to be an excellent attacker. “Battle Sister, Berry Mouse” is an Attacker that gains Power when an ally “Battle Sister” is placed on the field. When a “Battle Sister” is placed on a Vanguard Circle or Rear-Guard Circle, during that turn, this card gains Power+2000. If you call 1 ally, it counts as a 11000 Power attacker, making it easy for your attacks to Hit. And since this ability doesn’t require a Generatiin Break, it becomes easy to launch powerful attacks early on. The Character Booster “We Are!!! Trinity Dragon” contains many cards that support 《Oracle Think Tank》’s “Battle Sister”s. Look forward to future information!